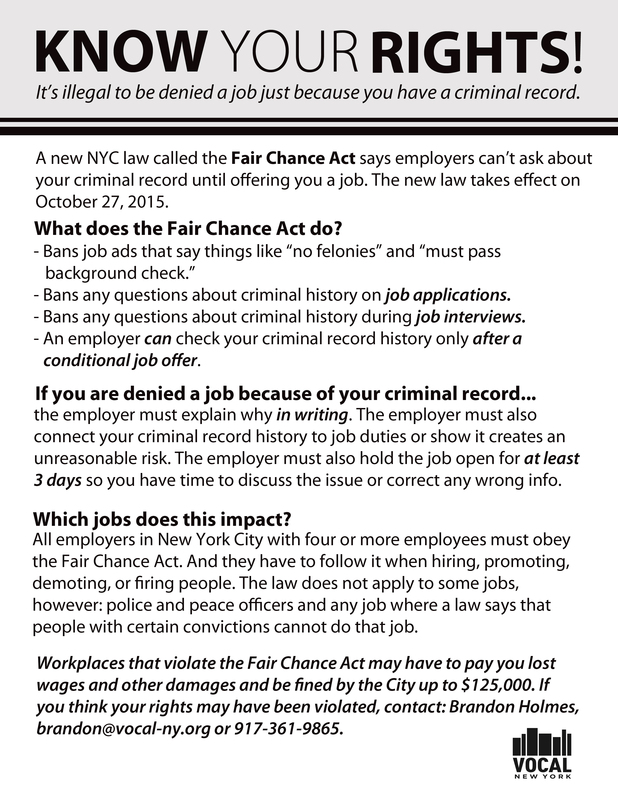 New York City—New Yorkers with conviction histories and their advocates rallied in Brooklyn this morning to celebrate the Fair Chance Act, a new law that takes effect today that will help ensure that people with records have a fair chance at employment and are not unlawfully shut out of the job market. The new law requires employers in New York City to look at job applicants’ qualifications first, and to hold off on background checks and criminal history questions until they’ve found the person they want to hire. The new law applies to all employers with four or more employees in New York City. It does not apply to some jobs, such as police and peace officers and any job where an existing local, state, or federal law says that people with certain convictions are prohibited from consideration. More detailed information about the Fair Chance Act is available here and here. The Fair Chance Act extends the reach of New York City’s existing fair-chance policy to the private sector. City government agencies have been operating under a fair-chance hiring policy since 2011, thanks to Executive Order 151, signed by then-Mayor Michael Bloomberg. It also includes important new facets that make it one of the strongest “ban the box” laws in the country. Major national employers, including Walmart, Target, Home Depot, Starbucks, Bed Bath & Beyond, and Koch Industries, have all voluntarily adopted corporate ban-the-box policies. The Obama administration is considering a federal policy for agencies and contractors, and legislation is pending in Congress. These policies are crucial tools for combatting stigma and discrimination, since nearly one in three adults in the United States has a criminal history that will show up in a routine background check. Leaders of the Fair Chance NYC coalition gathered with elected officials in front of the Barclays Center in Brooklyn today to celebrate the new law. The coalition of more than 25 community, labor, and faith organizations includes VOCAL-NY, the National Employment Law Project, the Community Service Society, 32BJ SEIU, and Faith in New York, among others. The Fair Chance Act was introduced by Council Members Jumaane D. Williams, Corey Johnson, and Ritchie Torres, at the request of Manhattan Borough President Gale Brewer. It was passed by the City Council in June.